Houston-Brooks Auctions is about an hour down the road. I don't get to drive down there often, but I do like to check out what they have coming to auction. If I see something special, I drive down, look it over and leave a bid. The auctions start at 6 a.m. on Sundays. I've learned through experience that if I go to the auction I sometimes bid on things I didn't intend to. 😉. This would be an example. I don't need a three foot sign in my kitchen. 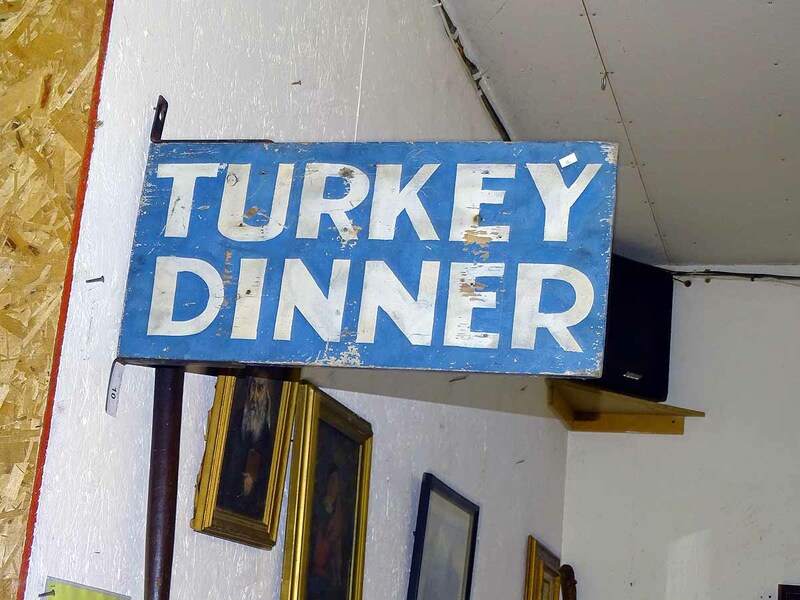 Churches and grange halls in our area often have bean suppers or turkey dinners regularly as fund-raisers. I love the straightforwardness of this sign. 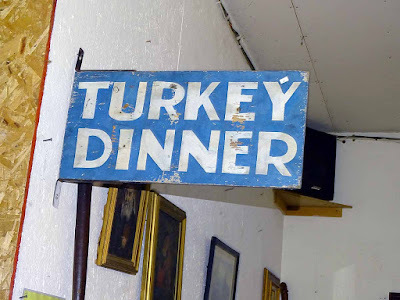 When you see the words "Turkey Dinner", you immediately have a picture in your mind, dont't you? Turkey, mashed potatoes, gravy, maybe carrots or squash or corn, very likely pie and coffee. Long lines of tables covered in paper. I used to love to go to bean suppers with my Granddad when I was a little girl. I can't place the age of this sign. Anytime from the 1950's to now? It's an interesting piece of Americana. What's more American than a Turkey Dinner?